Question Answered: Why is there an aviary at O’Hare airport? Starlings have a body density about 27 percent greater than herring gulls, another bird that makes many airports’ hit lists. 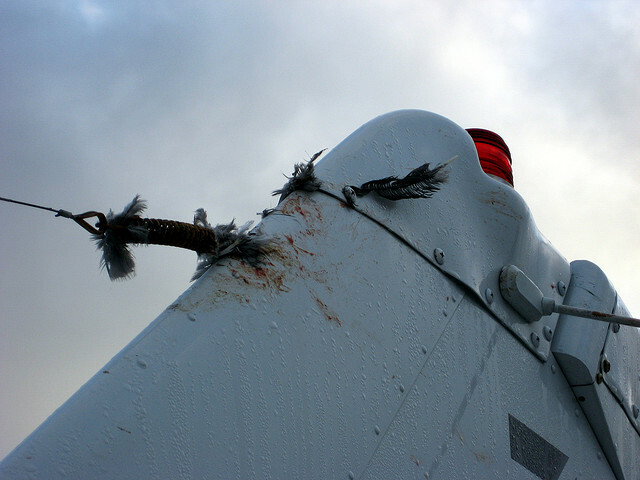 The end result of bird strike on a Cessna plane. The plane was fine, the bird was not. When Steve Brockway was leaving his job at the United Airways Reservation Center at O’Hare International Airport in mid-June, he noticed something he hadn’t noticed before; sitting between him and a runway was a wood cage of some sort — about 6 feet by 6 feet — with mesh wiring between the frames. And inside of that was a bunch of small, black birds. Maybe 20 to 30 of them. An aviary, according to Merriam-Webster, is a place for keeping birds confined. The dictionary goes on to clarify, though, that aviaries are mostly used to keep birds for pleasure or study. Which is definitely not what that bird-house at O’Hare was for. After forwarding Brockway’s photos to Gregg Cunningham, O’Hare’s Special Projects Coordinator (who, at first glance, was equally stumped about the photo as we were), we learned that this “aviary” is not an aviary at all — it’s a trap for an invasive species of bird called the European starling. These traps can hold a couple hundred birds at a time. All of them get euthanized by the U.S. Department of Agriculture. Starlings are a lot more troublesome than the person who brought them here thought they’d be. In the late 1800s, Eugene Schieffelin, a drug manufacturer from the Bronx, had the epic idea to import all of the birds mentioned in the works of William Shakespeare to the United States, his goal being to beautify charm-deprived New York City. And to do this, he thought, the world needed to look more like a Shakespearean play. Fast forward 122 years and we find that Schieffelin’s dream was fully realized … except the whole thing ended tragically and, instead of playing bit parts in some on-going outdoor theater, starlings play the role of eco-villains. European starlings are now the second-most abundant bird in the country and they’re not about to leave their adopted home any time soon. The little, black birds are highly adaptable and they’re hardly polite about it; they kick native birds out of their nests, eat our crops, devour our livestock’s grain and carry diseases. And, since starlings frequently travel in flocks, they poop in flocks, too. When their waste accumulates, it’s toxic enough to kill a mature tree. They can kill humans, too. In fact, it’s happened before. In 1960 an airplane taking off from Logan Airport hit a large flock of starlings over Boston Bay. The plane crashed, killing 62 people. Starlings are also expensive. Between 1990 and 2011, the birds caused $5,036,105 dollars-worth of damage to commuter airplanes, according to an FAA Wildlife Strike Database report. Now, in a way, airports like O’Hare are evening the score for us, though some experts wonder if we have to. Michael Begier is the national coordinator of the USDA’s Airport Wildlife Hazards Program. He estimates that, nationwide, USDA killed 1.5 million starlings last year. Part of that number — albeit a small one, the USDA wouldn’t specify — comprises starlings once caught in the trap Brockway photographed. While it may seem like a lot of dead birds, Begier says killing them is not the USDA’s first resort. The traps are part of a larger, integrated wildlife management plan that ultimately tries to reduce the attractiveness of airports to animals. “You know, you can’t just go out and trap everything and euthanize everything,” Begier says. “One, it’s not practical and two, it’s not really ethical." It is considered ethical — and legal, for that matter (starlings and other invasive birds aren’t covered in the Migratory Bird Treaty Act) — to kill the birds the USDA can’t keep away from the airport. That’s especially the case with starlings. Thus the “aviary,” er, trap, that Brockway saw. It’s there to catch the birds the USDA couldn’t drive away. 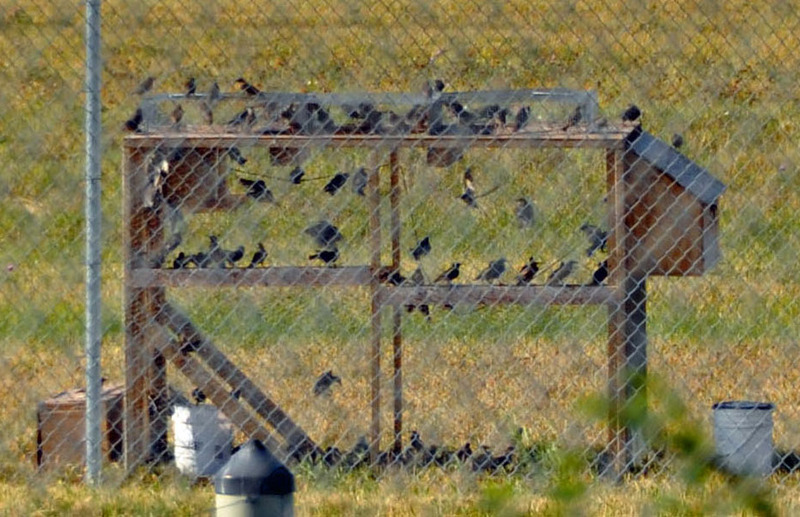 Once the birds are trapped, they are taken off airport grounds by a USDA wildlife biologist and gassed with either carbon monoxide or carbon dioxide. Then they’re incinerated. These actions are humane, according to American Veterinary and Medical Association guidelines. But does incinerating starlings help reduce the number of bird-plane collisions? “It’s really hard to say what’s working other than we do what we know to do,” says Craig Pullins, a USDA Wildlife Biologist at O’Hare. He adds the industry refers to the birds as “flying bullets.” Starlings have a body density about 27 percent greater than herring gulls, another bird that makes many airports’ hit lists. But Dr. Nick Carter, founder of a private bird management company called Birdstrike Control Program, argues airports may not need bird “hit lists” at all. Incentives for life … or death? Carter’s firm customizes comprehensive wildlife plans for his airport clients. He says each plan relies on a sound understanding of the airport’s surrounding ecology and — interestingly — none involves lethal control. For starlings, Carter recommends growing the grass in and around airports a lot higher. The birds, he says, avoid tall grass because they worry they can’t spot nearby predators. Wildlife management plans by Birdstrike Control Program may take more time, money and resources to implement than the USDA’s, Carter says. But those plans may pay off. Before Hurlburt Field, an Air Force base in Florida, hired BCP, it spent about $500,000 dollars a year on damages caused by birds. After? About $20,000 dollars a year, according to a study by BCP. The Air Force seems to buy this non-lethal approach. But commercial airports? Not so much. Carter says BCP appeals to the military because the military has to lay out its own cash each time a bird strike harms a plane. It’s basically got a deep incentive to prevent the strikes. At O’Hare, the private airlines pay for bird strike damages the airport — and its contractor, the USDA — is supposed to prevent. The USDA never feels a direct financial effect when a stray starling strikes a Delta Airlines engine, for example. At least, that’s Carter’s theory. Pride adds that the airport will stick with the USDA for the foreseeable future. So, relating to Steve Brockway’s question about just what the heck this “aviary” is doing on the grounds of O’Hare, the airport&apos;s plan is to use the USDA, and that agency’s plan is to trap and euthanize starlings, though some experts question that strategy. I thought we couldn’t do justice to Steve Brockway and his question without getting a better glimpse of what’s being killed for the sake of air safety. So early one July morning, I meet Geoffrey Williamson, who leads bird-watching tours for the Chicago Ornithological Society. He agrees to show me starlings in their natural state, while they’re just minding their own business, far away from airport security and wildlife biologists. (I should note, perhaps with a bit of irony, that Northerly Island is the site of the former Meigs Field Airport). July is a little early to see a flock (called a murmuration) but right as we put binoculars to our eyes, a swarm of starlings swoop down right in front of us. “Wow, that’s fortuitous,” Williamson says, still eyeing the birds through a pair of binoculars. There’s about 120 of them, flying around in a tight, little ball. They look like minnows following some kind of invisible roller coaster that’s suspended in air. In the fall and winter, when the birds are not mating, this is how they get around. 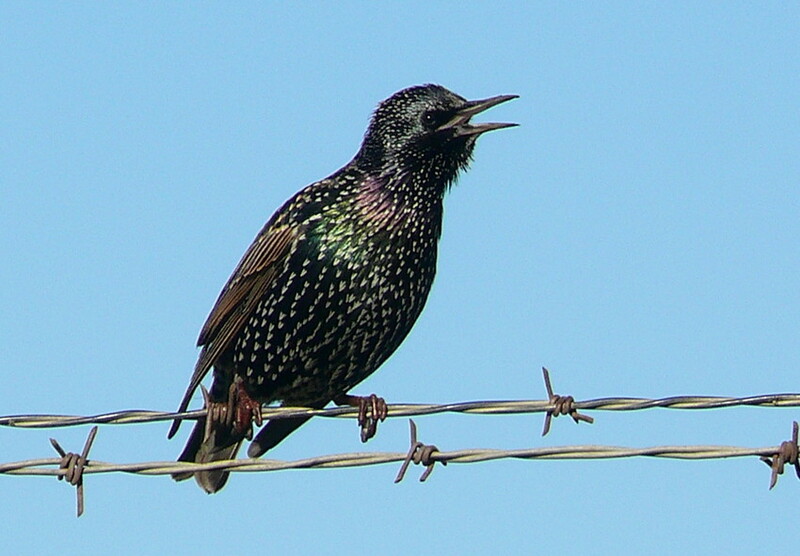 Starling murmurations can include thousands, if not millions, of birds. There are theories about this, but no one’s nailed down exactly how so many starlings can change direction so suddenly, and do so in unison. It’s ironic that people are so intrigued by murmurations — the same starling phenomenon that’s most dangerous to our airplanes. I’ll admit it. It’s easy to fall prey to the spectacle, even after recalling that a flock took down that Boston airliner and other flocks just like it cause millions in damages. “Are we at war with the starlings?” I ask. “I suppose some of us are at war with the starlings,” he says. And our question asker, Steve Brockway, says he&apos;s satisfied with our answer. "I guess I feel a little safer when I board an airplane at O’hare," he says. "And, you know, the Starlings are a nuisance animal and they are kind of taking over the natural habitat of all kinds of other birds. So, I suppose I’m not terribly upset that they’ve been euthanized… I guess. Sounds horrible, doesn’t it?"